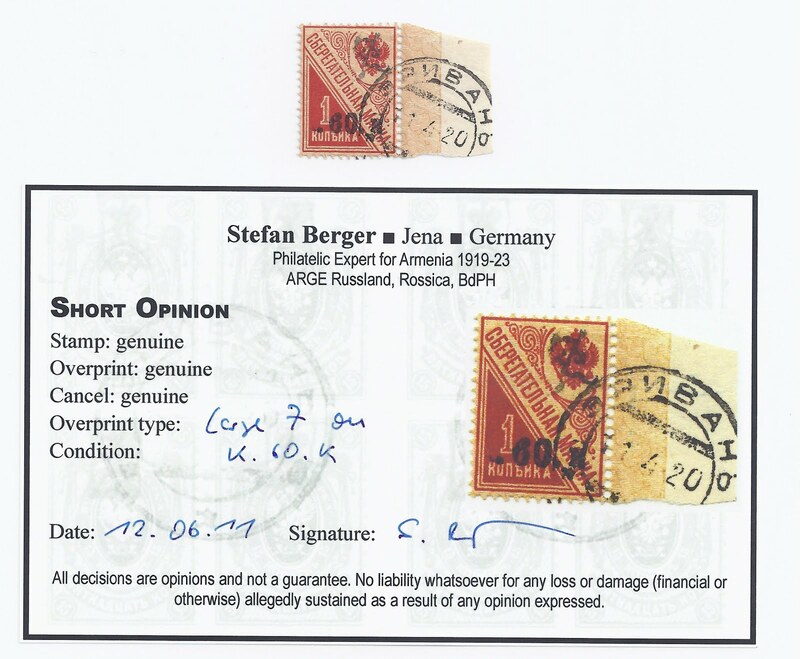 There is some difference of opinion as to whether Postal Savings Bank stamps exist with genuine Dashnak period overprints. I think they do, but that they are extremely rare. Here is an example. The stamp has been overprinted with "k.60.k" in black and then later, in a greyish ink, with a large unframed Z over the Imperial Arms. There is an authenticating ERIVAN cancellation of April 1920, which is an appropriate date. The stamp is signed in pencil by S Serebrakian (and was almost certainly from his stock), in green by Dr R J Ceresa, and it now has a Stefan Berger Short Opinion.